Originally from North Yorkshire Simon has worked with some of the best coaches in the world to grow his knowledge base before becoming Club Professional at Whickham Golf Club then moving to Lytham Green Drive Golf Club before becoming the resident Club Professional at Silloth on Solway Golf Club in 2017. Simon loves the all-round duties of a Club Professional and is dedicated to providing a premier service to all with expert unbiased advice. 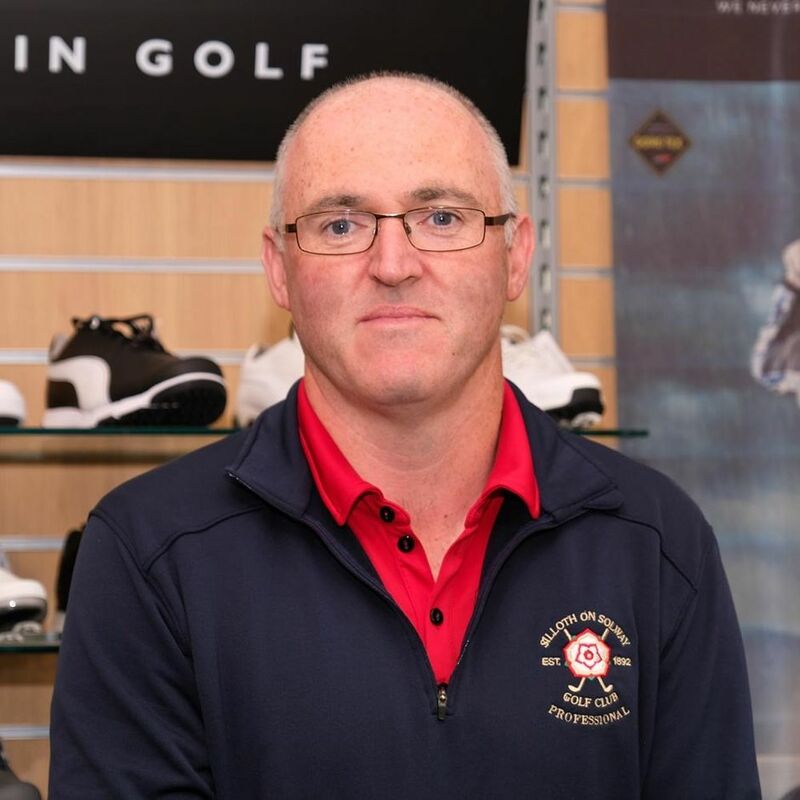 Simon has carried out a total refurbishment of the Professionals shop to the delight of both himself and the members of Silloth On Solway Golf Club. This enables Simon to display his range of clothing and equipment in such a way as to provide customers with a rewarding shopping experience. It is a major stockist of Callaway, Srixon, Cleveland, Odyssey equipment. As well as Footjoy, Sketchers, Galvin Green, Ivanhoe, Puma, Callaway and Greg Norman clothing and shoes. The popular Skycaddie and Bushnell measuring devices are also on sale along with a full range of Silloth on Solway memento clothing and accessories. The professional shop is open from 8:00am from Monday-Friday and 07:00am at the weekend. The shop closes at 6pm during the summer and at dusk in the winter. Fantastic golf course, a great test of golf on a fantastic links course. Thoroughly enjoyed every yard of it. Great links course, which tests shot making ability. In the prevailing wind need to hang onto a score on the front 9, and take advantage on the back, apart from the very difficult S I 1 par 4 back into the wind. Clubhouse very welcoming with relaxed dress code, good beer, and some of the best food served in a golf club. Overall highly recommend a visit. Most golfers know about Silloth Golf course as one of the best in the UK, i've had the pleasure of playing it many times and we will be back again soon. Even the hailstones didn't stop our enjoyment of playing such a cracking course. The most beautiful, unique, and yet demanding traditional links golf course. A must for every lover of the game, don't let the travelling distance put you off this is a gem. A fantastic and most interesting golf course. Be prepared for the unexpected. My annual pilgrimage to Silloth has turned into a 10 man tour, focused on the Solway Firth. Outstanding in every way. Simply stunning. From the warm welcome on arrival we were made to feel like it was our home course. The course was in great condition, you're well rewarded for good shots but it's brutal if you're wayward, exactly how links golf should be. Worth every minute of the long journey to play here. If you're thinking of playing here , book it, you won't be disappointed. The best value for money course I've ever played. Thanks for a great day. Very welcoming. Splendid course. Was guided by a member for several holes. Very adequate meal afterwards. Highly recommended. Great value. Well worth the drive. Just a quick note to express my thanks to all who made our visit to your wonderful golf club so enjoyable. Myself and 3 friends played your course on Friday last week and we all loved it. Everyone we met from the staff to the people on and around the golf course could not have been friendlier or more welcoming. The course itself is simply superb and a credit to those charged with its upkeep. Thank you all for making our trip so enjoyable. If Silloth on Solway Golf Club was anywhere else in the U.K. It would be far more expensive and much more difficult to get a tee time. One of my very favourite locations to play golf. The greens this year were as smooth and true as I have ever seen them. A long trip from Derbyshire but worth the effort; a fabulous course, great views and a friendly atmosphere. Best value course in the UK i've played. An authentic links experience which held up really well in winter conditions. Memorable hole after memorable hole and a great Cumbrian welcome on arrival. It is absolutely stunning. Every hole different (which is hard to do on a links), every hole beautiful. I played my best golf of the weekend and hit my highest score! Silloth is a truly fantastic links course that is worthy of it's place in the rankings. We were made to feel very welcome by the members and the Pro Simon and I will definitely be returning. Well worth the drive. I've just finished 18 holes at Silloth. I don't think I can remember a more enjoyable round of golf in recent years. Stunning layout, stunning condition, stunning scenery, what an amazing place. Many thanks.